March Madness Is Here! Which Products Are in Your Bracket? March Madness is right around the corner, so it’s time to start setting your brackets to see if you can predict the winners. 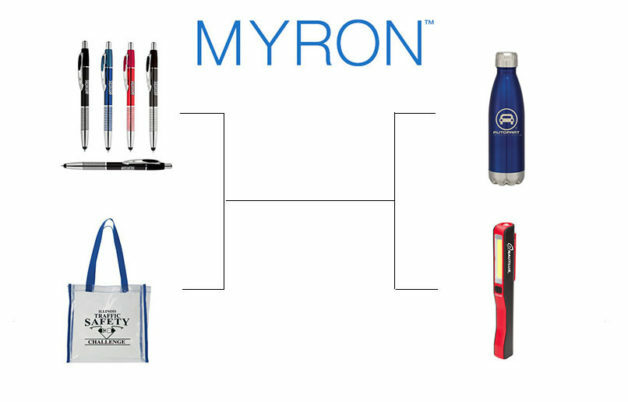 Here at Myron, we’re creating our own bracket of the best promotional products we have to offer. Here’s a look at who we think will take the top spot. A handy magnetic flashlight is a great way to light up your business. This unique and useful item will stand out in prospective customers’ minds, helping them to remember your business when they are ready to make a purchase. Clip this flashlight anywhere and watch your brand beam! Most major sports stadiums now require guests to pack their belongings in clear bags so security personnel can identify any weapons, drugs and other prohibited items. Buying these bags at the stadiums can be quite costly, so your customers will appreciate having their own ready to go. Pens are the perennial favorite around here, and for good reason. They are affordable, so you can get plenty of them at minimal investment from your company. Your customers likely use pens frequently in their daily lives, and they’ll be reminded of your organization every time they write. Pens are our number one pick – what’s yours? To get these and many other promotional products for your business, get in touch with Myron today. We’ll be happy to help you select the most appropriate options to keep your brand first and foremost in your customers’ minds. Which Promotional Products Get Your Vote? Why Should I Buy Promotional Products for My Business?